This species is accepted, and its native range is Medit. Forest, F. et al. 2018. Gymnosperms on the EDGE. Scientific Reports 8: 6053. doi:10.1038/s41598-018-24365-4. Pinus halepensis is rated as Least Concerned (LC) according to IUCN Red List criteria and has received a EDGE score of -8.02, which places it in position 861 on the EDGE Gymnosperm list. It has a Evolutionary Distinctiveness of 6.59, ranked 493. More information on the EDGE Gymnosperm project here https://www.edgeofexistence.org. Pinus arabica Sieber ex Spreng. Pinus colchica Booth ex Gordon & Glend. Retief, E. & Meyer, N.L. (2017). Plants of the Free State inventory and identification guide Strelitzia 38: 1-1236. National Botanical Institute, Pretoria. Cantero, J.J. & al. (2016). Novedades para la flora de la Argentina Boletín de la Sociedad Argentina de Botánica 51: 183-207. Dobignard, A. & Chatelain, C. (2013). Index synonymique de la flore d'Afrique du nord 5: 1-451. Éditions des conservatoire et jardin botaniques, Genève. Dimopoulos, P., Raus, T., Bergmeier, E., Constantinidis, T., Iatrou, G., Kokkini, S., Strid, A., & Tzanoudakis, D. (2013). Vascular plants of Greece. An annotated checklist: 1-372. Botanic gardens and botanical museum Berlin-Dahlem, Berlin and Hellenic botanical society, Athens. Dobignard, D. & Chatelain, C. (2010). Index synonymique de la flore d'Afrique du nord 1: 1-455. Éditions des conservatoire et jardin botaniques, Genève. Farjon, A. (2010). A handbook of the world's Conifers 1: 1-526. BRILL, Leiden, Boston. Mateos, M.A. & Valdés, B. (2009). Catálogo de la flora vascular del Rif occidental calizo (N de Marruecos). I Selaginellaceae - Rosaceae Lagascalia 29: 105-257. Farjon, A. (2001). 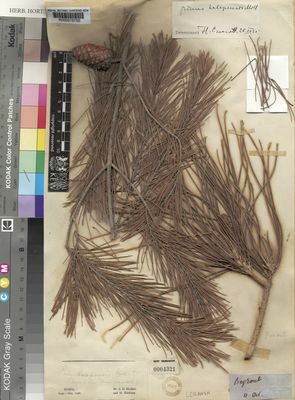 World Checklist and Bibliography of Conifers, ed. 2: 1-309. The Royal Botanic Gardens, Kew. Orchard, A.E. & McCarthy, P.M. (eds.) (1998). Flora of Australia 48: 1-766. Australian Government Publishing Service, Canberra. Tutin, T.G. & al. (eds.) (1993). Flora Europaea ed. 2, 1: 1-581. Cambridge University Press. Hassler, M. (2012). Flora of Rhodes. Systematic list of flora of Rhodes http://www.rz.uni-karlsruhe.de/~db111/flora/rhodos/list.php.